Triplets at 22 months are full of energy. Lots and lots of energy. They seem to have reached a new level of development and are very keen to explore and always want something to do, but their concentration span is still limited. So during their waking hours life in our household proceeds at a frenetic pace. Take for instance yesterday morning. I have photographic evidence documenting typical madness. The camera making the appearance because there was paint. Paint and toddlers always makes for good photos. We now have a craft room. 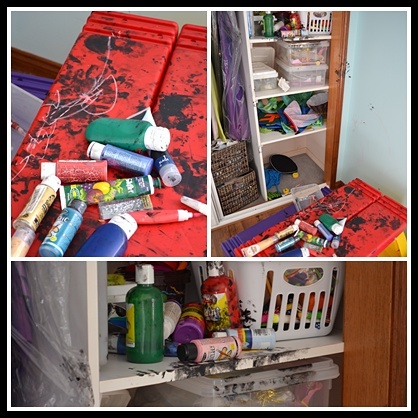 The craft room is out of bounds to the babies unless they are accompanied by an adult. They totally disregard this rule if the door is not shut. Normally the mess they make is throwing pencils around the room. Yesterday they discovered the paint stores. Actually, I should be specific. Imogen and Jayden discovered it. Toby was a good boy. The culprits. I was in the middle of taking their clothes off when I had the bright idea to photograph their state. Why is it that of all the colours available, black had to be their favourite? The scene of the crime. I am so glad that my beautiful purple formal dress had plastic over it. The unrepentant duo. Kissing each other after a ‘job well done’. Of course the third party wanted to join them in the bath. At which point I realised that the reason he had been so quite is he had been creating a huge dirty nappy. It was a pleasure to give him a bath after it had been changed. Trent getting in on the action. 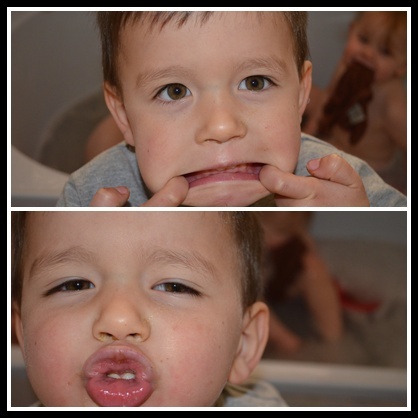 Photobombing is a popular sport for my boys and their cousins at the moment. They prefer the bomb to not be so subtle, they just shove their face in front of the lens. 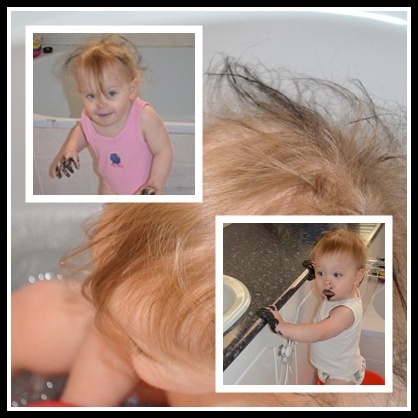 Sometimes it can get really hectic with dressing the trio after their bath. Such as in this picture. Jayden and Immy wanted to get out of the bath at the same time. Desperately. I got Jayden out, went and put Playschool on, got Immy out, started dressing her, she ran away and in the meantime Toby starts playing with the taps, so he was out too, so I just dressed them one by one in front of the television. Later that afternoon, they had a debrief about the whole affair. I’m sure it was a debrief. It couldn’t possibly be a planning meeting about further exploits. Could it? Isn’t it great though, that you can be so incredibly busy and have so much to accomplish in maintaining a home, but God can be teaching you so much to develop your character at the same time. Patience really isn’t one of my strongest virtues, and I can be prone to panic. Having triplets is helping me to learn to stay calm, get things done, one bit (or person) at a time, deal with the most urgent need and working my way down the scale. It helps to remember that I am one person, and doing my best is absolutely good enough. It’s normal for us females to have little obsessions. Shoes are a popular weakness. Handbags are another thing that females can develop an obsession for. Jewellery makes some go weak at the knees. And the thing about these female obsessions, age appears to be no barrier. Little girls go clomping about in Mummy’s high heels wearing their plastic beads and swinging a little handbag. My girl has developed her first love. 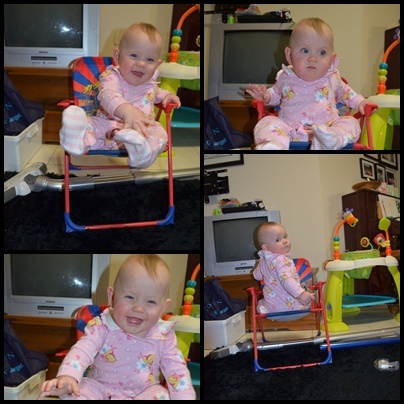 This was the first time she discovered she could climb up onto a chair by herself. She then sat their like a queen and watched the boys playing with a regal air. In the next few days we travelled up to my parent’s beach house for a holiday. Imogen was overjoyed to discover some chairs there. Once again, she was happy to recline and supervise. From then on, you never knew when you would turn around and discover you were being observed from her seat of prominence. I know she’s in the same outfit as the first photo, but it is a different day. The wine behind her isn’t hers. Although she did discover it before I remembered I had put it in such a foolhardy spot. I’m happy to report that neither girl or wine was harmed thanks to super quick Mummy reflexs. The many faces showing the delight that chair sitting brings. And a little chair is an excellent perspective upon which to enjoy one’s birthday balloons. And then one day it seemed that kiddy chairs were no longer sufficient. I walk into the lounge room to discover little Missy calmly sitting on the lounge chair reading a catalogue. Although it appears when you are only just one page turning is tricky. Next she discovered the tub chair. She was pretty proud of herself. The boys joined in. They all thought it was a fun chair to hang out in. Because the other day Toby was discovered sitting on HER chair. Immediate action was initiated. And before you knew it, she showed him who is boss of all chairs within this house! You sit on my chair, I sit on you.